Slater is being courted by an exclusive fraternity while Leslie is being courted by a sorority. 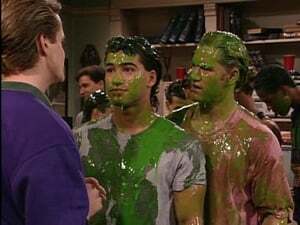 Zack really wants to get into the same fraternity as Slater, but they don’t seem as interested in him. Zack pretends that he plays hockey in order to impress Rick the fraternity guy, but it turns out that the Rick plays hockey also, so Zack has to go to the tryouts.